How do I match up transactions on my account? 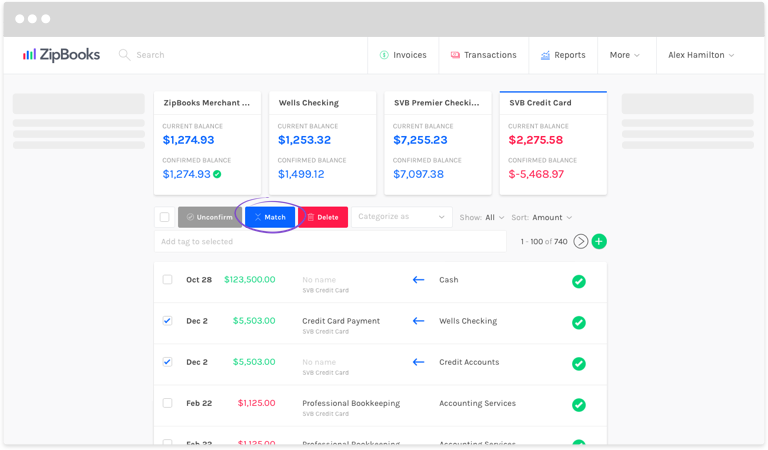 When you pay off a credit card balance, or business loan, or move money around among your own accounts, you can use the match feature in your ZipBooks account to show when transactions relate to each other. Find the transaction that applies and click inside the check box on the left side of the line. Find the other end of the transaction and click in that box as well. Click the blue Match button that appears above the list of transactions. That’s it! A blue arrow will now appear in each transaction pointing to the account that money was moved to or from.